KWerner Design Color Challenge #50! Wow...50 Color Challenges over at Kristina Werner's Blog! I can't say that I participated in all of them, but I did in several. Some of the colors she chose really pushed me to do something different...like this one! So, without further ado here is my creation for #50. Accessories: SEI brads, fibers from my stash, SU Chocolate Chip wide grosgrain ribbon, 1/8" circle punch, 1/16" circle punch, SU scallop punch, tag corner punch, lace punch by ??? 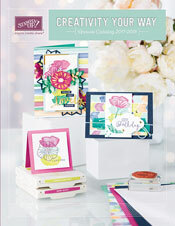 I have been finding lots of inspiration lately in previous issues of Cards magazine. Here are two cards that were sparked by the January issue. I hope you enjoy them! One of my favorite things about this card is the vine felt border. I cut my own felt border! It is a vine Sizzix die and self-adhesive felt. I have been wanting to try using felt with my Sizzix Big Shot, and I really like how this turned out. I can't wait to try this technique with other dies! I had a long break on my posts before, because I was busy creating for the Stampin' Up Artisan Award contest. Part of the rules are that I can't post my projects to my blog. So, you'll just have to take my word that they were beautiful! I made 5 cards, 3 scrapbook pages and 2 3D items. Whew! Also, here are a couple more cards from our girls weekend get-together. Two versions of a baby card with some Copic coloring, and another with yet some more resist paper I created. Enjoy! I bought the 6x6 paper pad of Basic Grey's Porcelain collection not too long ago. While at Archiver's this past weekend, I also picked up a bird-house stamp set that coordinates with this line. I think they are really cute...elegant and very girly. Anyway, here is a card with those supplies, and two more with the remnants of supplies from the first card. The green panel is using the resist technique I referred to in my previous post. I used Vintage Creem ink on Solarcrest Vanilla paper. Then brayered over that with PTI Spring Moss. I got together with my crafty friends Janie and Tiffany this past weekend. We had a piece of paper (the paisley) that Janie had given us at our last get-together with a challenge to use it, all of it, and the patterned side not the plain! So, here is what I came up with. Also, the large green polka-dot strip was made using a variation of this technique by Heather Nichols. I changed it a little and used Mellow Moss SU cardstock, Versamark ink with Polka-Dot stamps and brayered Always Artichoke classic ink over the Moss paper. This card is 3 2/3" x 8 1/2". I made the red layer using the border Happy Everything stamp from the Around and About set by Papertrey Ink. The second card is made using the leftovers, which was suggested by my smart friends! What a great idea to make small cards with the leftovers. Let me know what you think. I love these colors too! These are the colors that I want to redo my kitchen in. Maybe I should ask Kristina and/or Dawn to help me redecorate my house...LOL! Anyway, when I first saw Dawn's inspiration piece, I was thinking about using some Making Memories paper that looked a lot like the fabrics. But, instead I decided to play around with the Papertrey Guide Lines Two set again. I love this set! I was tempted to try and find something to layer on top of the background, but I decided that it should be the focal point. I also found some ribbon that really made the design pop. I really like how this turned out, so I hope you enjoy it too. By the way, I first tried stamping on top of Kraft cardstock, but the Craft Inks weren't opaque enough. So, if you have a recommendation of good opaque inks that work with any type of stamps, please post a comment to let me know. Thanks! I love these colors! They are my favorite colors, and the colors I want to redo my living room with. I'm currently looking for a sectional in a chocolate color, and collecting fabrics in baja and kiwi to make throw pillows with. Anyway, here is the inspiration piece and my card for the challenge. After I put the patterned paper down, I was wishing that I had inked the edges first. But, the adhesive had already done it's job. I did ink the edges of the baja breeze label to make it stand out from the patterned paper background more. Enjoy! Ok...I went back to the drawing board to create something else with this beautiful color combo, and I like this card much better. I think before I was wanting to make something bold, but that beautiful soft background was also in my head. This card came together much easier and was a more enjoyable experience. It uses some new diecuts I just purchase for my Silhouette. Enjoy! It's time for another color challenge from Dawn McVey. I really liked the colors and the inspiration piece. But, tonight, when I sat down to the table to create, I couldn't find my creative mojo. Has anyone seen it? I did make a card, but it was a struggle. At first I was just going to use the floral piece. Then, I was just going to use the piece with Around and About, but it seemed a little plain as I didn't have it set on a background. Anyway, here is my creation (my 3rd creation! ), but I'm still not happy with it. So, if you like it or if you have suggestions for improving it, please let me know.